We asked new graduate students, seasoned scholars, and postdoctoral veterans to share notes on Ono’s style. 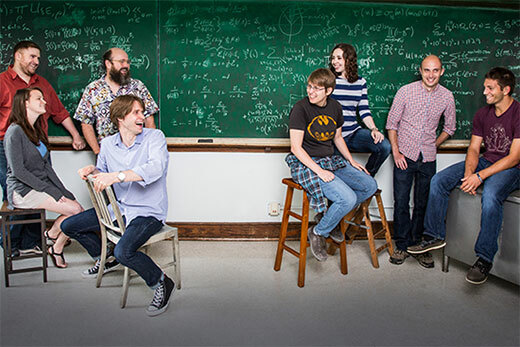 Pictured clockwise from top left: Jesse Thorner 16PhD*, Robert Schneider 17PhD*, Lea Beneish 20PhD*, Michael Griffin 15PhD, Ian Wagner 15C 20PhD*, Sarah Trebat-Leder 18PhD*, Robert Lemke Oliver 13PhD, and Olivia Beckwith 18PhD*. (*Anticipated completion year.) Emory Photo/Video. Surrounded by current and former students, Ken Ono is in perpetual motion—bouncing from conversation to conversation, firing off questions about progress on current work, debating problems, and offering up anecdotes related to the ideas being discussed. Ono, Asa Griggs Candler Professor of Mathematics, is an internationally recognized number theorist who has earned renown for proving theorems that have long puzzled the greatest minds in mathematics. Many of Ono’s students come from institutions around the country specifically to study with him, while others find him by fortuitous chance—all promising intellectuals whose academic paths have crossed with Ono’s. Ono’s own path to academic achievement might have taken a very different turn if not for an almost preternatural connection to a gifted Indian mathematician who died almost a half century before Ono was born. Srinivasa Ramanujan was a poor clerk in Madras, India, in 1914 when he began to write letters to the renowned mathematicians around the world, begging them to review his work. One of those letters caught the attention of British mathematician G. H. Hardy, who recognized the genius in the writer and arranged for Ramanujan to study with him at Cambridge University. During the next few years, until his untimely death at age thirty-two in 1920, Ramanujan made highly original and unconventional contributions to mathematics that have inspired research to the present day, including much of Ono’s work. “Following Ramanujan, whether I’ve meant to or not, has always been my destiny,” says Ono. The son of a mathematician—Johns Hopkins University Professor Emeritus Takashi Ono—Ken Ono displayed remarkable mathematical aptitude from a tender age. As a child, Johns Hopkins psychologist Julian C. Stanley observed him for his study of exceptional talent.